Welcome to Keith Avis Printers! 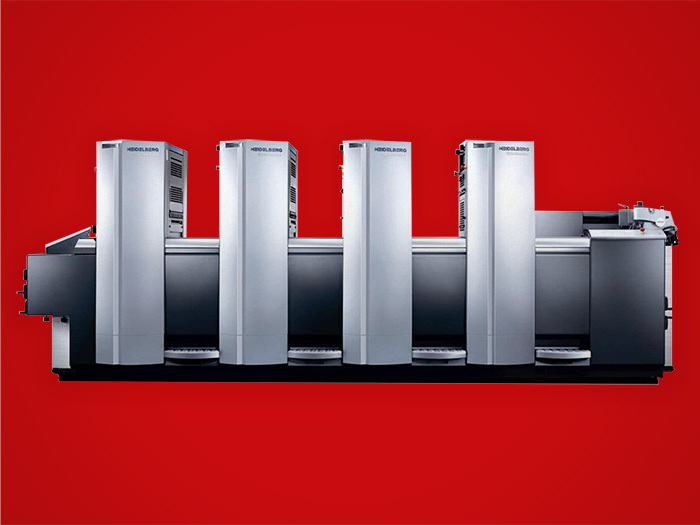 We produce a vast range of full colour printing for all your requirements. Whether it's brochures, leaflets, booklets, programmes or quality business stationery, we can do it. 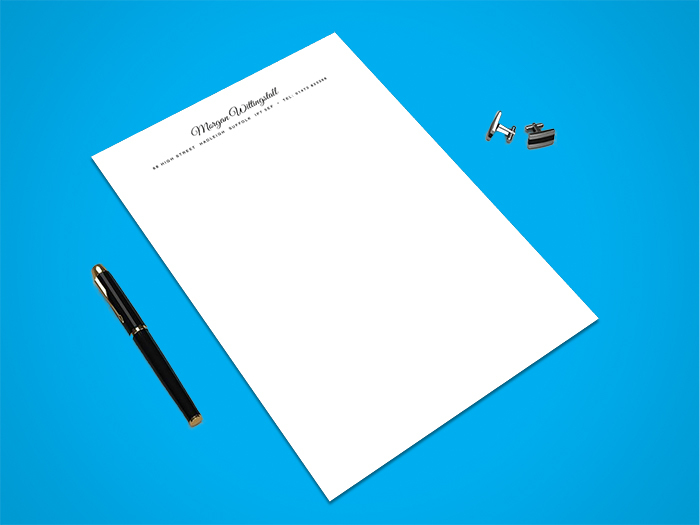 Add a touch of class to your correspondence with our high quality personalised stationery. Show off your unique style by choosing from our range of typefaces and papers. We offer an extensive range of large format solutions for posters, prints, exhibition stands, window displays, banners, pop-ups, canvas prints, self-adhesives and signage. Here are a few of our most popular items. Click a category for more details! Letterheads, Business Cards, Leaflets, Envelopes, NCR Forms etc. Vinyl Banners, Canvas Wraps, Posters, Display Boards etc. Headed Note Paper, Correspondence Cards, Change of Address cards etc. We can print or source almost any printed item you can think of! Need a quote or have a question for us? Leave a message and we'll get back to you as soon as we can. 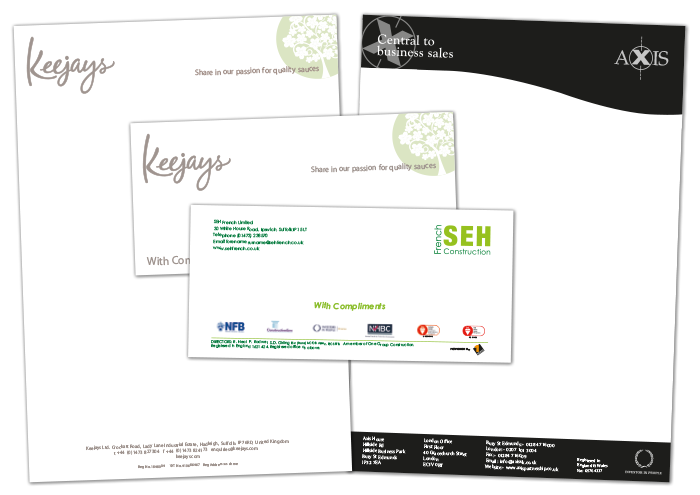 Letterheads, Business Cards, Leaflets, Compliment Slips, NCR Forms etc. From letterheads and compliments slips to business cards and invoices, your stationery will be seen and kept by customers, influencing the way they see your business. We use the latest software and techniques to produce the best visual impact for your stationery designs and aim to provide the fastest turnaround times possible. We provide proofs to our customers in PDF format, so you don't need to be local to Hadleigh for us to work with you. Your stationery often provides a first point of contact for your company in the business world, so it's best to leave the right first impression. 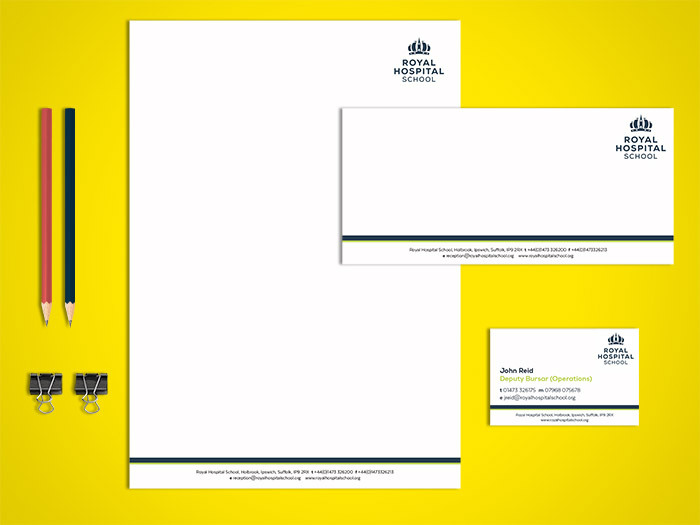 Our team produces top quality stationery to be proud of. We can work with you to come up with a new design, or if you have something that you are already happy with, we are more than happy to work with your existing artwork too. We supply our stationery on a huge range of papers, from standard laser guaranteed stocks which enable customers to use a plain letterhead for letters, quotations, etc, through to high end and special papers such as the popular Conqueror and Connoisseur ranges, as well as many others. Letterheads, as with most of our stationery, can be printed in one to full colour, one or both sides and we can apply foil blocking, blind embossing or thermography for a premium finish. 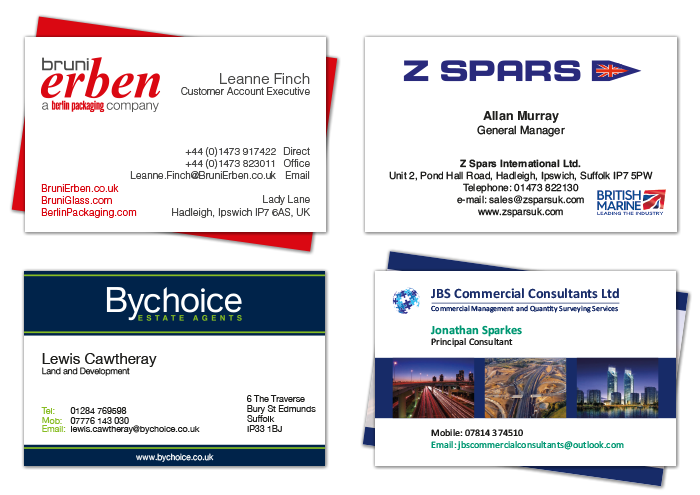 Business cards are an excellent way to provide your contact details to new acquaintances and prospective customers. Make your cards - and yourself - stand out from the crowd! You can supply artwork or we can work with you to come up with a new design. Our standard business cards are printed on 450gsm thick silk board and matt laminated both sides, with other board types and special finishing options also available. We have literally hundreds of samples for you to look at, just call in! 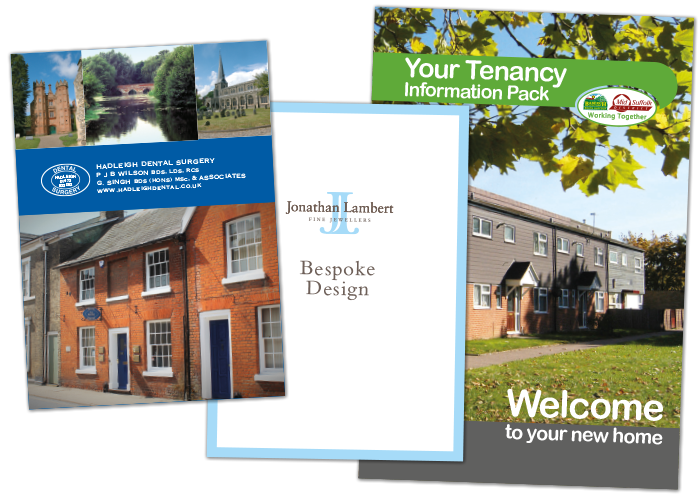 Leaflets are an invaluable promotional tool, whatever you may be promoting. 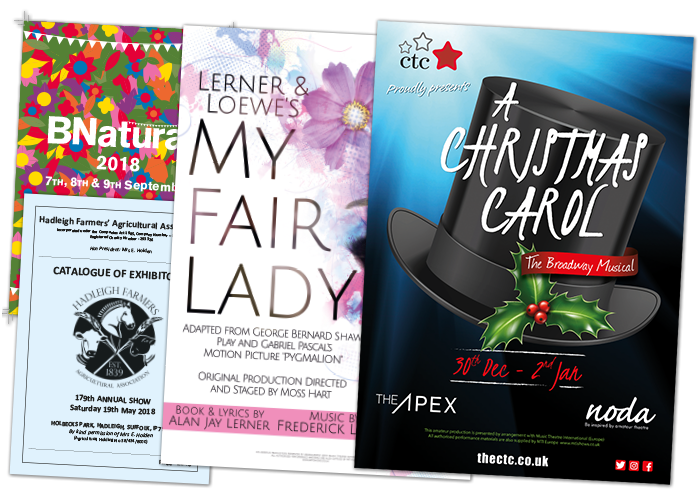 We can produce artwork to make your leaflet stand out, whilst still clearly and concisely getting the important details across to your target audience. Standard sizes are DL (99x210mm), A6 (148x105mm), A5 (148x210mm) and A4 (210x297mm), but any size can be produced, folded or flat - just ask. 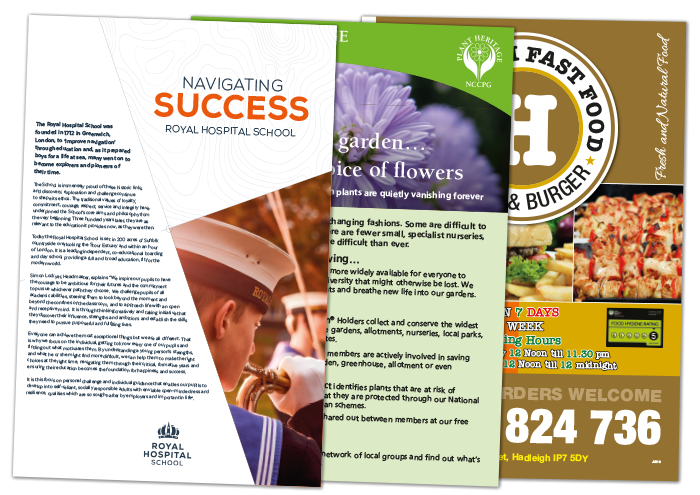 We supply our leaflets on a range of papers and thicknesses, from lightweight plain bonds through to heavier silk and gloss coated papers. We are happy to send you samples, simply give us a call. 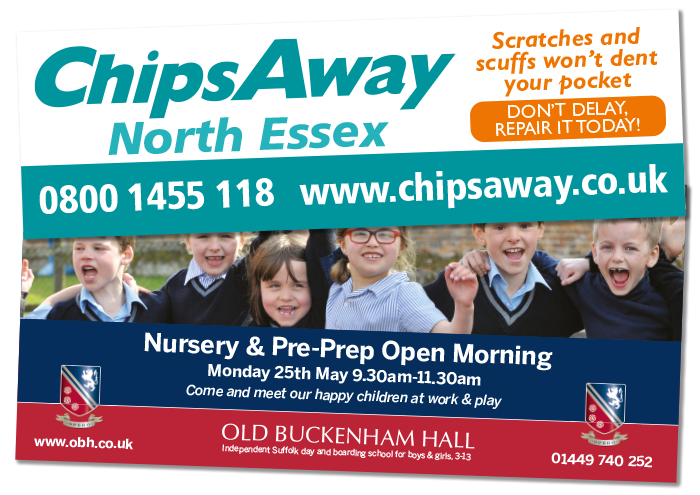 Leaflets can be printed in one to full colour, one or both sides and we can apply gloss or matt lamination, or UV spot varnishing for a premium finish. Impress your customers with our high quality custom printed envelopes and be sure to avoid the junk mail pile! 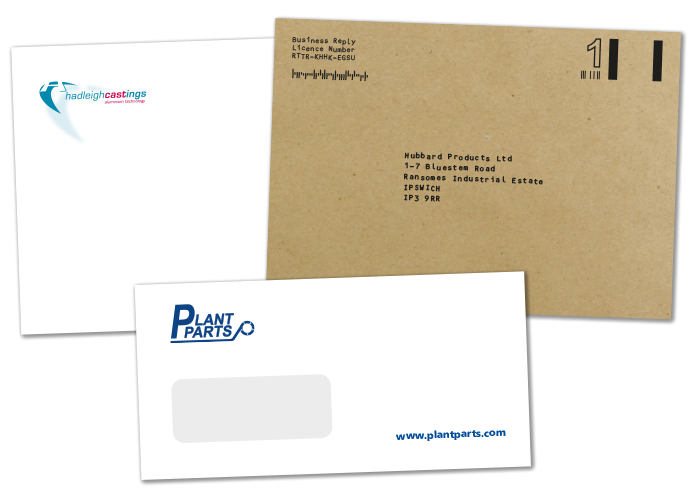 We provide a range of envelope sizes, colours and types, including business envelopes with windows. Printing can be with a single ink colour through to full colour, front only or both sides. With so many options available, we would recommend you call one of the team on 01473 823366 or email kelvin@keithavis.co.uk to discuss your requirements. We are also able to arrange direct mailing from your supplied list of customers, please give us a call if you would like more details. We are the experts in NCR business forms! 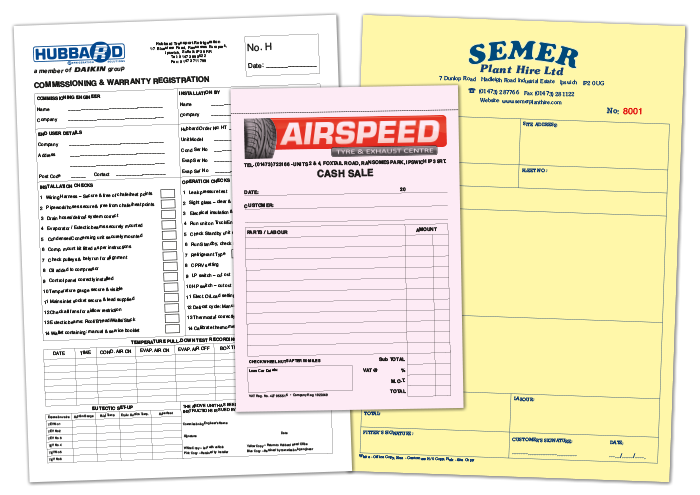 We can supply your carbonless forms in several ways - either glued into sets of two, three, four or five, glued into pads or stapled into books with covers which have a writing shield glued in. Just give us a call with your requirements for friendly advice and a fast quotation. You can supply your own artwork or we will happily produce for you. Our prices are fully inclusive of all artwork, proofing and printing - we even deliver to your office! We have a various paper colours available for your carbonless forms, which can be printed from single to full colour and numbered sequentially if required, perforated in any position and drilled to fit your filing system. 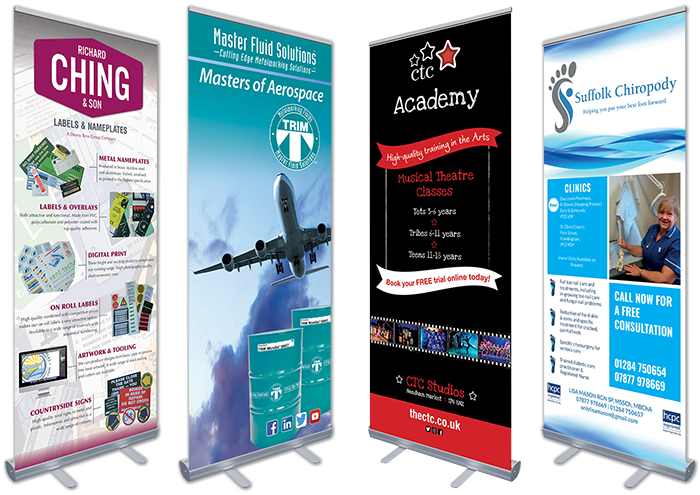 Popup Banners, External Vinyl Banners, Canvas Wraps, Posters, Site Plans etc. We offer an extensive range of large format solutions for posters, prints, exhibition stands, window displays, banners, pop-ups, canvas prints and self-adhesives. 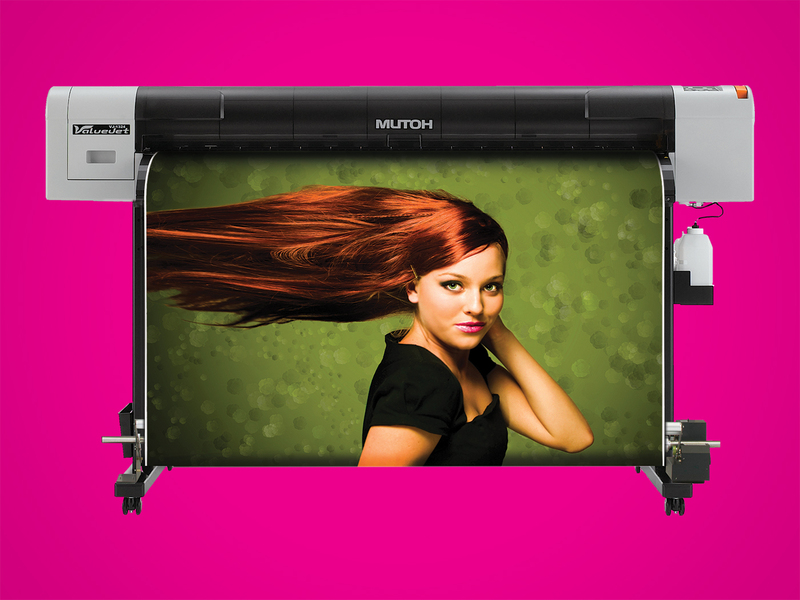 Our Mutoh wide format printer utilises an eco-friendly ink system to produce sparkling colours and high detail results. 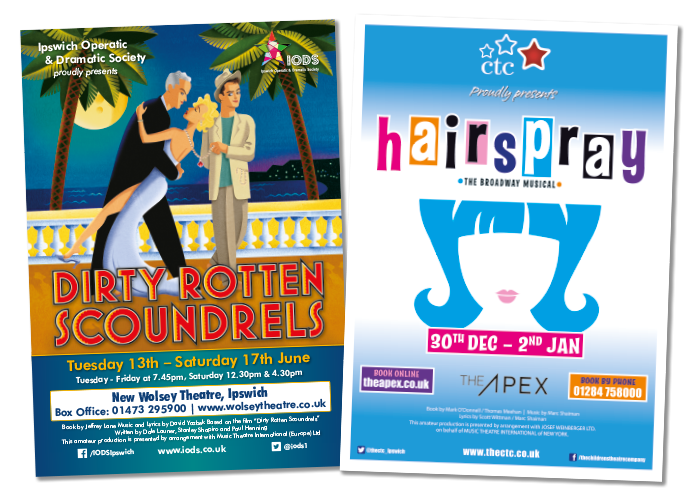 Posters are all about drawing attention to your product or event, so if you need some assistance, our design team knows what ticks all the right boxes to grab people's attention. We supply our posters on a range of papers and thicknesses, from lightweight plain bonds through to heavier silk and gloss coated papers. Correx is a lightweight fluted (corrugated) board that has an excellent level of stiffness. Ideal for external signage and displays, correx is commonly used for estate agent boards. 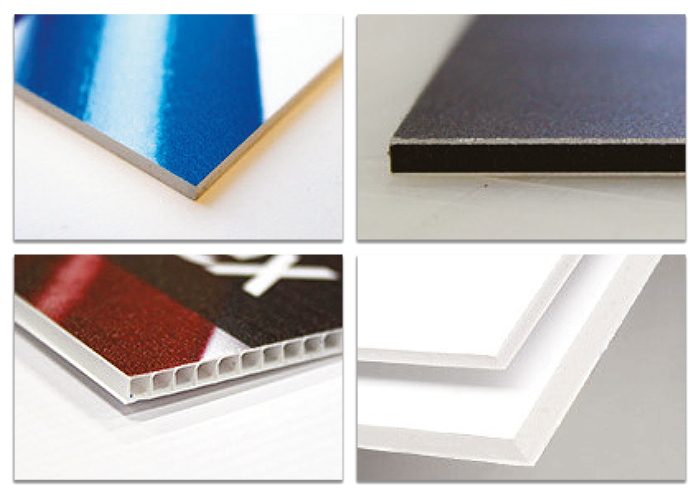 Foamex is an ultra lightweight foam board and can be easily installed with adhesive or strong double sided tape. It is perfect for indoor display use and is easily portable even with larger sheet sizes. Foamalite is a medium weight foam centred board. Our most popular substrate, we can supply this in either 3mm or 5mm variants. It can be installed with adhesive or strong double sided tape, as well as having the durability to be screwed straight through. Dibond consists of two aluminium sheets sandwiching a rigid polyethylene core. This is our most durable option and is well suited to outdoor applications. Why not give us a call to discuss your requirements, or drop in to view our printed samples. Printed directly on to industry standard reinforced white PVC in full colour with eyelets. Our vinyl banners are suitable for indoor or outdoor use and are printed in high-quality full-colour with fade-proof ecosolvent inks. They are also flame resistant to DIN75200. We can also produce banners on mesh material, which is predominantly used for large banners where it's important that air be allowed to flow through the banner stopping the 'sail effect'. We use a premium coated mesh material that will allow the air to flow through whilst still having enough closed consistency to show print without losing vibrancy. Our mesh banners are printed in high-quality full-colour with fade-proof ecosolvent inks and are M1/B1 Fire Rated to comply with UK and European Fire Safety Standards. We can produce your banners to any height and width, just ask for more information or a quote. We have samples to view, just call in and compare with others you may have seen around, we are sure you will agree the quality is second to none! An excellent and increasingly popular way of displaying your favourite photograph. Our wraps come ready-to-hang and are printed in vibrant full colour onto thick white canvas wrapped around a solid frame. The quality is second to none, but don’t take our word for it, just call in and see the examples we have on display and we are sure you will agree! We can print your plans from a supplied digital file to provide your builders with a sharp and clear copy to work from at the correct scale. Plan prints can be produced at up to A0 size. Add a touch of class to your personal correspondence with our high quality personalised stationery. Let these items show off your own unique style. 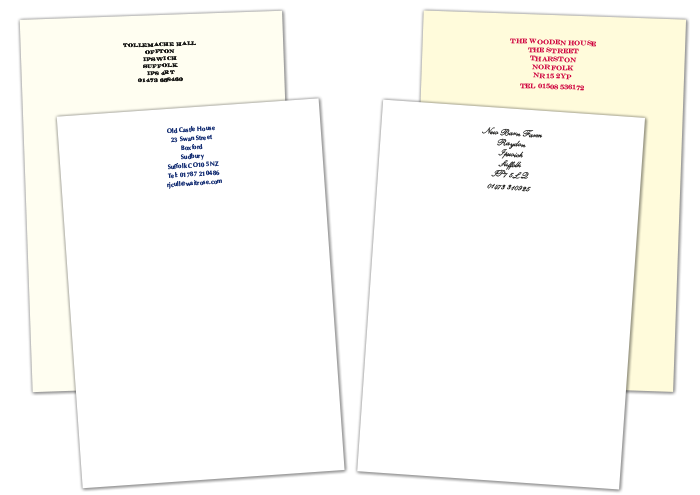 We offer personalised notepaper, correspondence cards and change of address cards, all printed on high quality papers or board and with matching envelopes if required. We also have a huge selection of ink colours to choose from and can even give your print a premium raised thermographed finish if desired. Why not drop in to view our huge selection of printed samples? Our personalised headed notepapers are perfect for writing out short messages and are far classier than scribbling on plain paper! We can even provide matching envelopes and continuation sheets if required. We create your notepaper to match your own unique style, so you can choose from a huge range of traditional and modern typefaces, papers and inks to get exactly what you want. Just call in to see hundreds, yes hundreds of samples! We supply our notepaper on a huge range of papers, from our standard laser guaranteed stocks, through to high end and special papers such as the popular Conqueror and Connoisseur range, as well as many others. All available with optional raised thermographic printing for a high quality look and feel. Our high quality personalised correspondence cards are the traditional way to respond to invitations, but can also be used for so much more! 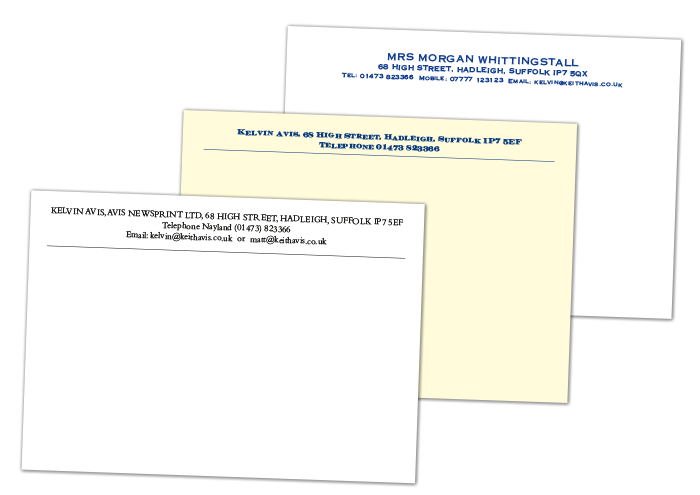 We can even provide matching envelopes and headed notepaper if required. Choose from a huge range of traditional and modern typefaces, papers and inks to get exactly the sytle you want. We supply our noteheads on a huge range of papers, from our standard laser guaranteed stocks, through to high end and special papers such as the popular Conqueror and Connoisseur range, as well as many others. Correspondence cards can be printed in single to full colour and we can also supply raised thermographic cards for a high quality look and feel. If you're moving home, why not have some personalised change of address cards produced? Our change of address cards are a perfect way to let friends and family know that you have moved, and most importantly, where you have moved to. Easily the best way for letting people know your new details, they are a permanent reminder that can be pinned to a board or filed away safely for future reference. We supply our change of address cards on a range of high end and special boards, such as the popular Conqueror and Connoisseur range, as well as many others. 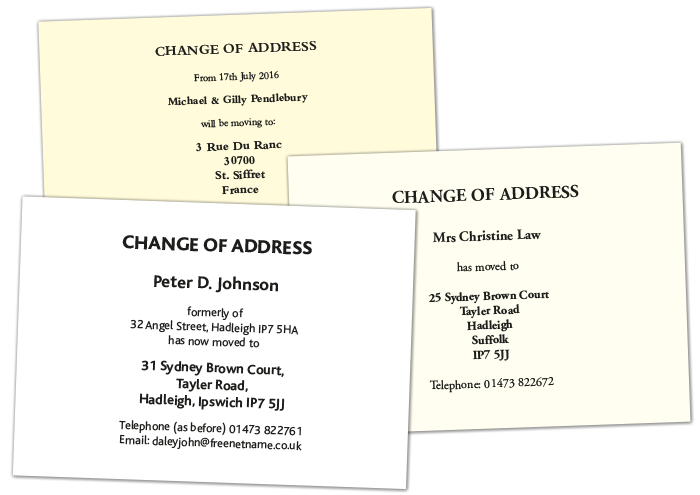 Change of address cards can be printed in single to full colour. 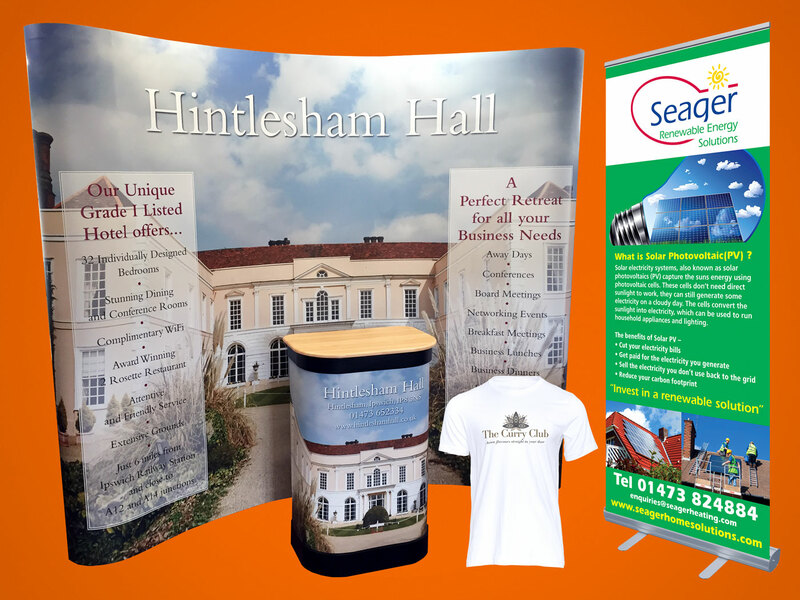 Our exhibition displays have excellent build quality and are designed for multiple use, as you would expect. For certain items, we can print single or double sided depending on your requirement. Printed directly onto satin lightblock pvc in full colour, our high quality pull-up banners will not curl or peel, cannot easily be scratched or damaged in transit and can even be wiped clean. The roller banner mechanism we use is easy to assemble in 30 seconds and comes complete with a padded carry bag for easy transportation. We can even change the graphics for you at a later date if your details change. We have popup banner samples to view, just call in and compare with others you may have seen around, we are sure you will agree the quality is second to none! Need urgently? No problem, we offer a same day service if needed. Our most popular size is 2 metres high x 850mm wide and is only £99.00 plus VAT with FREE artwork. Other popup banner sizes are available, just ask for more details. These display units come with their own carry case, which makes transport to trade-shows and other events/locations easy. They are available with straight or curved options with graphics which are printed on to lightblock material, a superb opaque material that is semi-rigid and designed for repeated use. The material is very durable and protects against minor damage such as scratches and scuffs. The Podium Pack is an option designed to make use of the carry case that is supplied with the Pop-Up Exhibition display. This turns the carry case into a podium by providing a graphic to be wrapped around and a wooden counter that sits on top. The graphic is printed on the same material as the Pop-Up display, so you know it offers the same quality and durability. We know that planning every detail of your wedding can be stressful enough - why not let us make this part a little easier for you? 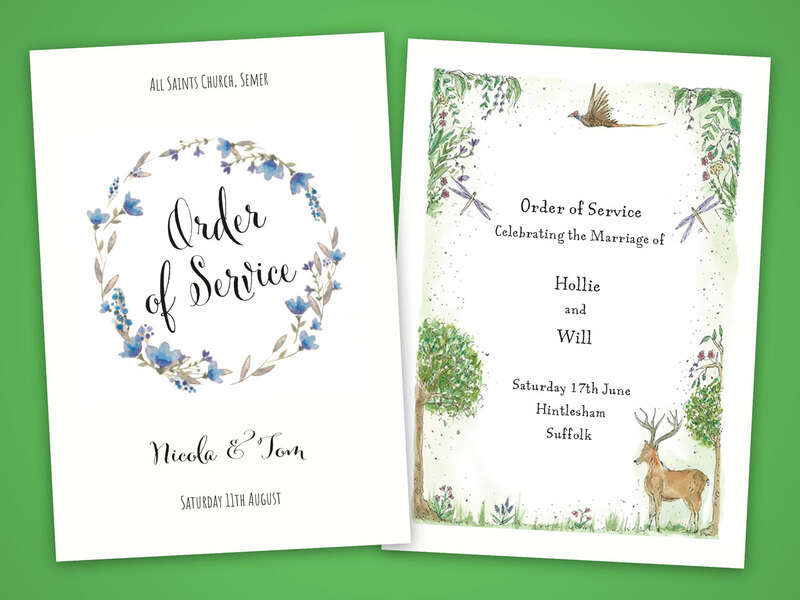 We can create any of the items of stationery you'll need for your wedding, from the Invitations and Reply Cards, through to Seating Plans and Place Cards for the day itself. We supply our wedding stationery on high end and special papers such as the popular Conqueror and Connoisseur range, as well as many others. Wedding stationery can be printed in one to full colour, one or both sides and we can apply foil blocking, blind embossing or raised thermography for a premium finish. Supplied in various sizes, the most popular being those to hold A4 and A5 Sheets, our superb Presentation Folders are supplied ready to use. The folders have internal pockets which are cut out using a steel die and are then glued down. Pocket size and shape is down to your preference, or to save money you can use one of our existing die shapes. Our Presentation Folders are printed from one to full colour, with optional gloss and matt laminate coverings or spot UV varnishes to emphasise logos and photographs. These folders are generally printed on top quality gloss, silk or matt coated boards. If you need some guidance, give us a ring or drop us an email. Brochures are a great way to inform your customers about the products or services that your company can provide. By clearly presenting information, your customers can feel more confident and empowered to make the right choice, in turn increasing your sales. 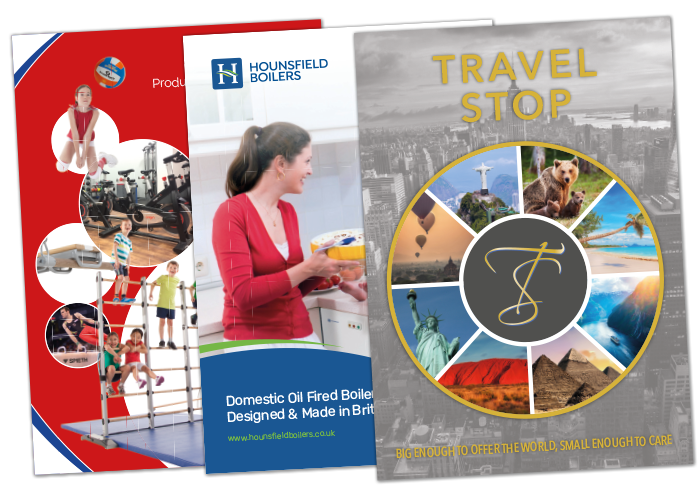 We supply our brochures on a range of papers and thicknesses, from plain bonds through to heavier silk and gloss coated papers. We are happy to send you samples, simply give us a call. Brochures can be printed in one to full colour and to the outer covers we can apply gloss or matt lamination, or UV spot varnishing for a premium finish. Using die cutting processes, we can cut your printed items to almost any shape you can imagine. 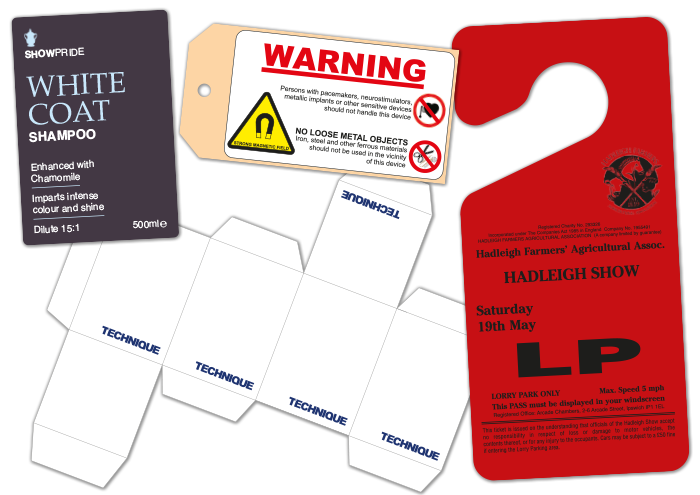 Whether for business cards, door hangers, branded boxes, shaped stickers or indeed anything else that you can imagine, don't feel that straight cut edges are the limit! Ever wanted to get your written masterpiece out to the masses? We can help! We provide a full service for the typesetting and printing of your work. All you need to do is supply the content, we can work our magic to produce a proof from there. 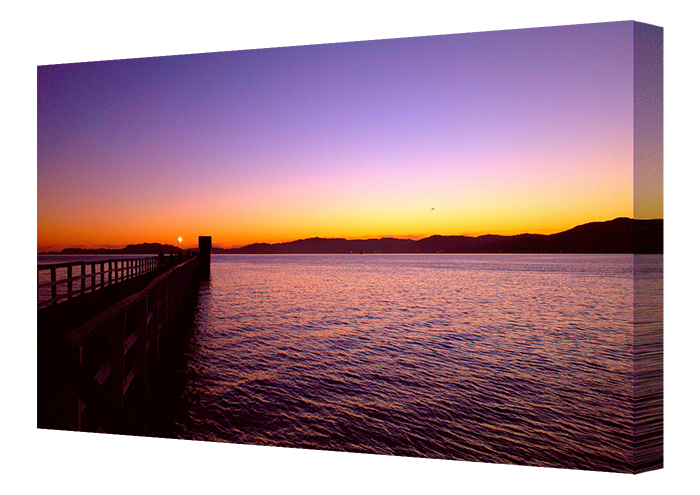 You can of course supply your own print-ready artwork too. 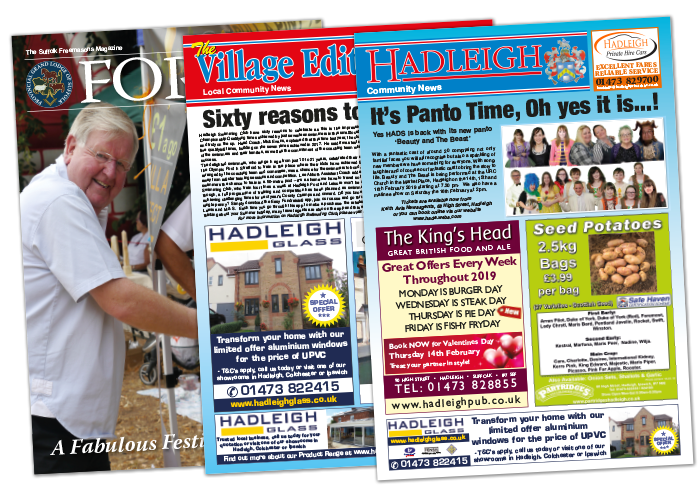 We even produce our own Community News Magazines in-house, so you're in safe hands with us! Holding a village fete? Putting on a theatrical show? Organising a concert? We can produce programmes for your event to your exact specifications and to suit any budget. We supply our brochures on a range of papers and thicknesses, from plain bonds through to heavier silk and gloss coated papers. We are happy to send you samples, simply give us a call. Whether you want photos of family and friends, or something a little more formal to promote your business, we can create a design to suit your needs. 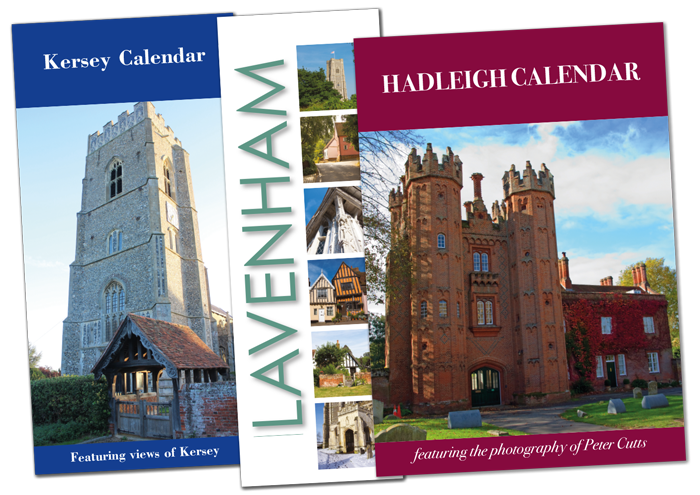 Printed on quality papers, our calendars are available to either hang on the wall as a poster format, or to stand on your desk. The entrance for the print department can be found in the covered area linking the High Street and Magdalen Road, right next to the Co-op supermarket. Free parking is available nearby, both on the High Street and in the public car park on Magdalen road. For deliveries and collection of larger jobs, our car park can be found just off Magdalen Road, behind the bus stop.